I speak to you at this time in our political history, when it appears that all reason has fled. That all regard for our constitution and for other institutions of our country have been disregarded and that we are seeing, sadly, a creeping dictatorship which threatens our very democracy, threatens our rule of law and threatens the survival of our country. I do not do this to scaremonger. I do it out of a concern for this country of ours and it is my intention to get our people to think in a very practical but rational and reasoned manner about where we are in the development of our country. Where we’ve come from and to determine where we want to go. To determine also, what sort of system? What kind of leadership do we want for our country? What kind of legacy we want to leave and what example we want to set for our children? Do we want an example of disregard for law and order? Do we want callousness? Do we want a disregard for due process or do we want a system which is governed by laws? A system which speaks to our history, our heritage and the democracy to which we have been accustomed? It is clear to me and I am sure it must be clear to all of us in this country, that the Nevis Island Administration, established by the constitution of this country in 1983, has been thoroughly undermined by the Federal Government and has been disregarded and that the people of Nevis, will have to stand firm, to ensure that what was gained by the blood sweat and tears of some of our forefathers that we do not allow this to go a begging. We have seen the indecent haste and the disregard for due process in our Parliament some two weeks ago on the 16th of January 2015. We have seen the challenges in the Court to that process of having constituency boundaries changed, in a manner unprecedented, whatever anyone may say and whatever reference we wish to make in respect of 1984, what transpired on the 16th of January in our Parliament, is unprecedented and cannot be tolerated and ought not to be accepted. I am aware, that challenges have been foisted in the Court and the court has ruled and I respect the judgment which has been handed down by the Court. However, there are two aspects of laws, there is the aspect of the letter of the law and there is a spirit of the law and every action which we take, there are also two aspects. Do we engage in that action in a way which is reasonable which meets with standards of morality, standards of ethics or do we do take action and then we disregard all decency, all morality and all ethical behaviour? This is what I want our people to begin to look at. When we sat in the House of Assembly and had the Speaker turn his back on Members of the Opposition in derision, it is time for us to evaluate where we are and to determine how we got here. So tonight, as I speak to you, the antiques which were demonstrated in the Parliament and the acts of near treachery and the angry rhetoric which has attended that process, I believe, were calculated to create fear in the people of our country and it is to that I want to address our minds. Are going to allow fear? Are we going to allow threats? Are we going to allow those who have become desperate to foist their way of thinking on us? Or are we as a people in Nevis and St. Kitts and even the Caribbean, to adopt a reasonable position and not tolerate this kind of callousness and disregard for decency? It is time that we challenge this now. I choose to mention that because it is fundamental to what we have come to understand as the rule of law and the democratic process and if we as a people, recognise the power which we have as electors, as citizens of this country, the decision to choose the leadership and the type of leadership we want to have, then it is time that we see our roles as not being just followers but in fact, as the creators of the type of government which we need and the type of government which we believe we deserve. Now we look at the discussions in the press, we look at the discussions on the talk radio and I want to say to you that it is time, it is time that we the people of this country and you as our constituents, take your roles seriously. Some people will argue, that there is no difference between and among politicians and I beg to differ. I think we can look at the history, we can look at the attitudes, we can look at the behaviours and determine what sort of behaviour, what sort of attitudes do we want as part of our leadership in our country. I call on all of us to have open minds, to have open hearts and to look at what is happening in our country and to look at what will happen in the next couple of weeks as we face an election and that we become bold, that we become fearless and not allow threats, not allow people to bribe and not allow ourselves to be coerced but rather to think soberly, to think consciously about what we want for our future, so that our children can be happy in this land of ours. It is important that as a fledgling nation, 32 years as a nation, this year, that we see ourselves as wanting the best for ourselves, wanting the best system for ourselves and wanting to put aside all those negative attributes and attitudes which have characterised what happened in the last couple of months, perhaps in the last couple of years, as you went through a seriously torrid time in terms of our democracy here in St. Kitts and Nevis. 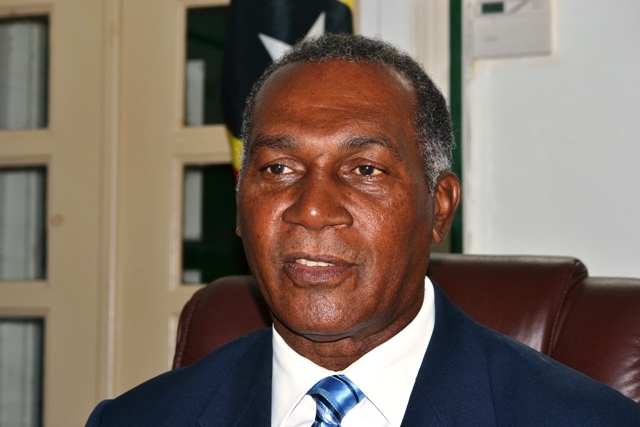 I want to say to us in Nevis especially, that we have to recognise that your Concerned Citizens Movement (CCM) Administration before, under Dr. Daniel, made some gains and we have to stand fast and stand firm, that we do not see these gains whittled away by those who wish to see the end of the Nevis Island Administration or even those who would want to rule Nevis from Basseterre. In 2013, we as a CCM Administration gave concessions to you the people of Nevis on a reduction in the surcharge on electricity. I am happy, that electricity rates or the cost of fuel has reduced significantly and we should see certain reductions in the cost of energy but the surcharge reduction which we made, was made sacrificially but I want to say to you, that the government, your CCM government, did that to ensure that you as citizens in this country were not overburdened with utility costs. We also looked at certain infrastructural work which we have done. We have looked at crime and security and in looking at that aspect in our country’s history, we are threatened by violent crimes and we need to face it head on. As I said in my New Year message, it is time that we seek to slay the dragon of crime and violence in our country. So as a government, we have put CCTV around Charlestown and its precincts, from Pinneys up to Valu Mart and we’ve done that because we want to protect and secure that very delicate area of our country. We have also looked at the completion of the Hamilton Road at half the cost of what was estimated in 2012. We have witnessed the increase in tourist arrivals and this has come because your CCM Party in government and the Nevis Tourism Authority have taken the bold decision and the right decision, to go out and market Nevis again. We have seen an increase in businesses in the Financial Services Department. That industry which floundered between 2006 and 2012, is now coming alive again and it is the intention of your CCM Administration, in this year, to continue with the promotion and development of that industry, so that we can see growth which would reflect not just in revenues for our country but would reflect in increasing jobs, as well, in that industry. I can say that yesterday, I had a discussion, the Financial Secretary and myself, with one of the leading providers of Financial Services in Nevis and they have committed already to expanding their business and to increasing employment. We, on our side, have undertaken to facilitate this by granting the concessions necessary because our job as government, is to so facilitate the development of the private sector. We believe that we can work in partnership with the private sector to grow the economy and to ensure that increase in employment results. We look at the implementation of subsidised utility for our senior citizens. This, I think, is a landmark achievement for the people of this country and we are doing that because our senior citizens have served this country and we believe, that they should not, in this day and age, not have access to electricity and water as priority or as fundamental for their health and their safety. We have, also at Health, procured two new ventilators and anaesthesiology machines for the Alexandra Hospital and this is critical because the development of Health in our country, is a priority for your CCM Administration because health, is a prerequisite for good living. It is a prerequisite because of the status we have as a high end tourism destination, we expect, that those who come here, will would want to feel comfortable knowing that we have good health services here in this country. We look at our schools and every single school in this country, in the year 2014, was given a rehabilitative job. Reason, they have been allowed to run down and we cannot allow our children to be subjected to unfriendly environments in the schools. In addition to that, we purchased chairs and desks to ensure that our children had their accommodation in the classrooms to undertake their studies because your government cares for the children of this country. Two weeks ago, we commissioned a new school bus and I want to say to us, that in short order we may see the commissioning of, if not one, at least another two buses for the use of our children and one of those buses we shall dedicate to the children at the Special Ed, now the Integrated School because we think those children need to be given specialised attention and not be jostled about but they need to be treated with care. We look at the increase in economic activity and all of us in this country, when we look at the increase in and I say bustle and the traffic in Charlestown on a weekday and especially on a weekend. In talking to the business places and the businessmen, they are indicating that business is now buoyant, that they are seeing increase in businesses and this is an important message for our people because with increase in business, we shall now be seeing increase in employment because as business grows, more staff will be required and there would be expansion. So we are now seeing those signs of economic activity and upturn in the economy of Nevis. In addition, in this year 2015, we will see a plethora of projects. We have had already ground breaking for Paradise Villas. We have seen the Butlers Estates commence their preparatory work. We know that in short order, we shall have the H TRIP Candy Resort break ground and we look at other projects. The projects at the Paradise Cabanas at Jessups and these are just a few of the areas which we shall see increasing activity in our country. So 2015, a year of promise, a year of hope, I believe that we the people of Nevis or the people of St. Kitts and Nevis, must take as I said earlier, a serious look at what do we want in terms of our leadership. Do we want persons who are looking for hand outs or do we want people of independent mind, independent thought who would fight the battle for the people of Nevis? I want to say as well, that we cannot compromise and we cannot renege on the gains which we have made. It is whether or not we want to see progress or we want to see creeping dictatorship take hold or we want to see our democracy thrive because we have seen a trespassing on our democracy. It is time that we as citizens take hold of our country and do what I right by our consciences, so that we can see the ongoing development, ongoing growth, so that our legacy for our children that they can have a future in our country. Thank you. God bless you and let us not be fearful but let us be fearless and bold. Thank you and God bless you.